This was all you could ever want in a comedy match. Gallagher rolled Dar into a ball and kicked him in the bum. They did a rolling near fall reversal circle for a while, and Gallagher won with a running dropkick. - Samoa Joe came out for a promo. He said that he has Shinsuke Nakamura’s medical report and it says Nakamura is out 6-12 weeks. He wants to either face Nakamura or have him stripped of the title. Mr. Regal came out and said he will handle what Joe caused. Joe went face-to-face with Regal before leaving. Physical match, Lorcan used a headlock early to keep the advantage until Aries sent him over the top to the floor on a scary spot. Aries won with the Horns of Aries for the submission victory. Aries got on the mic and called Hideo Itami a coward, leading to Itami making his way to the ring as Aries bailed. Big boot by Kay for the win. Amazing stuff here, crowd was behind Alexander all the way. This was the best match Almas has had in NXT. Alexander won it with a lumbar check and the two embraced after the match. - Regal announced the return of the Dusty Rhodes Tag Team Classic. The tournament begins “tonight” and will culminate at NXT TakeOver: Toronto. Dillinger hit the Tye Breaker for the win. After the match, Bobby Roode met Dillinger at the ramp and said he needs a perfect partner to win the Dusty Classic. Their team would be Perfectly Glorious. - The Ealy Brothers vs. The Revival never happened as Samoa Joe destroyed the giant twins as Revival watched from the ramp, zipped their jackets back up, and left. Joe demanded Regal bring him Nakamura or he would keep on destroying people. - The Authors Of Pain defeated two enhancement talents in a squash match. Paul Ellering said the next chapter will unleash a plethora of pain. Asuka got the armbar submission fast. She then proclaimed that no one is ready for her. Competitive match with Itami showcasing all he's got before hitting the GTS for the win. Aries hopped the rail and attacked Itami from behind after the match, but was fought off and Itami sent Aries packing. Total destruction by the AOP as they hit their leg sweep finish for the win. Great crowd reaction for Swann. He hit the handspring elbow moonsault for the win. Perfect Plex by Royce for the win. - Dan Matha came out for his debut match, but was destroyed by Joe. Joe demanded that Regal hand him the title in one week. This was everything you'd expect from these four. As Almas sat in the ropes doing his tranquilo taunt, Alexander dove over him onto Revival in a major spot early. The heels worked over Almas until the hot tag when Alexander ran wild before Revival hit the Shatter Machine. Almas turned on Alexander after the match, beating him down and dropping him on the steps. The crowd was all over Almas. Roode never took his robe off and allowed Dillinger to be destroyed. The Sanity act is visually great with smoke and apocalyptic outfits. Young and Cross didn't reveal themselves until after the match. Royce grabbed Morgan's foot as a distraction to allow Kay to hit the big boot and get the win. Great reaction for Sabbatelli and Moss who are live event regulars. TM61 won it with Thunder Valley on Sabbatelli. 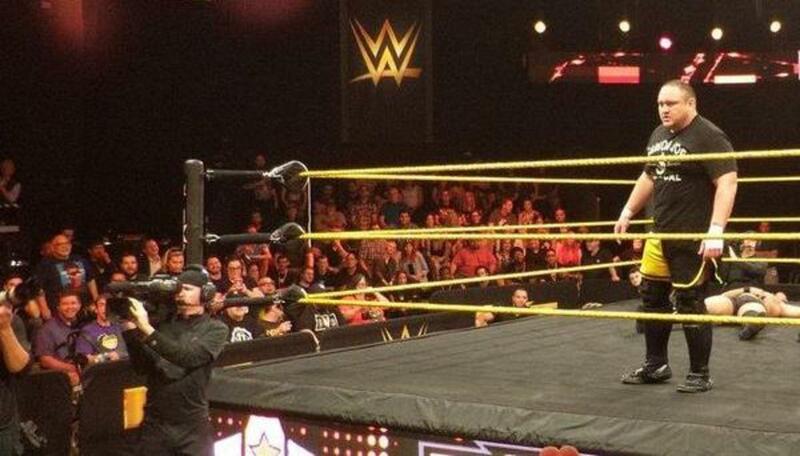 - Blake vs Murphy went to a no contest as Samoa Joe destroyed them both and called out Nakamura. Nakamura showed up in a neck brace, took it off, and they had a wild brawl. Nakamura hit a Kinshasa on a security guard and Joe in the center of the ring to send everyone home happy.